I have had a book sitting in my To read pile for a long while. It was The Mirror Empire by Kameron Hurley. I had read God’s War and really loved it and picked up this book when it was released but there were several other books that I picked up at the same time. It languished in the pile and kept getting moved to the bottom. I did a little organizing and took some time to think about why I had not read it yet. I realized that I was hesitant when it came to the idea of Grim Dark. I didn’t know if it was something I wanted to delve into especially as I was working in Child Protective Services when I picked up the book. There is only so much secondary trauma that I can take. I have recently switched jobs and at a place where grim dark will add more to my plate. So, I added the book to my Audible account and started listening to it while worked out and ran. I loved Mirror Empire. It presents a world that is fascinating and yet alien. It hits on the fantasy tropes for there is magic and mystery abound without every utilizing the standard fantasy tropes. 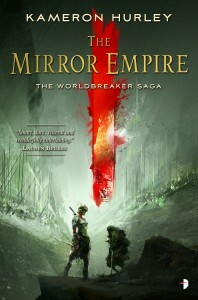 In Mirror Empire, there are no elves or dwarves. There are priests but not in the fashion that one is used too. Magic is present but the wand waving and finger-twiddling are are eschewed for a more astrological bent. I was hooked from the first chapter. In a style similar to God’s War, Kameron Hurley creates a world that is both alien and understandable. The first chapter introduces Lilia. She is a young girl whom if following in the footsteps of her mother. She works with her mother learning the ways for herbs, poultices, the wilderness, and blood magic. Lilia is knowledgeable in all these things and yet still a child that plays on a rock constantly trying to fly. It is through her eyes that we first catch a glimpse of this strange world. A world where trees walk, vines and plants are constantly trying to find a way in to the village to feast upon the people. A world where blood gives a person a level of control over the world around them. This first chapter provides excellent foreshadowing of the things to come in Mirror Empire. Lilia’s village comes under attack from strange outsiders. Lilia runs to the village to see what she can do to help but is to late. The invaders have set the place on fire. Lilia’s mother comes to the rescue and takes her hand and the run. It is not far enough though and Lilia is forced to hide while her mother confronts the marauders. Lilia is taken from her hiding place and pushed through a rift between worlds. She stands and watches in horror as her mother is struck down and the surviving invader comes for her, only to be blocked by some invisible barrier in the gate. And the story is begun in blood, death, and grief. Kameron Hurley has created a world that is fascinating. The world is recovering from a devastating war from over two thousand years ago. The semi-sentient plants that plague the people of the world are just one of the remnants of this conflict. The world is built on a system that is different from our own. Women are the movers and shakers of these worlds and the me are the ones that must struggle for respect. It is a world where relationships are agreements and marriages are between multiple men and women. Queer relationships are part and parcel of the world and are accepted as normal. There are societies where there are more than two genders and room for more than three. Hurley has created a world with a society that requires consent before touching and makes it real. The characters Hurley creates are human despite the fantasy elements of the world. She avoids the standard characters that have minor character quirks and embraces the flaws that are present within all of us. There are no people here without flaws which makes the people met in the book both difficult to love but no less fascinating to follow. In particular, Zezili captures this for me. Zezili is the quintessential powerful women of her time. Through a bit of luck, she escaped slavery and has risen to a place of power in the army of her empire. She has a husband that belongs to her. His beauty and her ownership of such a trophy elevates her social standing even further. And yet, despite this abhorrent idea of ownership and her abusive nature, she truly loves him. It is a twisted type of thing but it is love. It just takes a while for this to become apparent. The magic and cosmology of the book are also interesting. Hurley plays with idea of multiple realities. There are worlds that sit adjacent to one another and and share many similarities. Each person exists on each world which hampers the individuals movement between worlds. If you still exist on the other world, you can not crossover. This simple fact sets up the political machinations simmer under the surface in beginnings of this series. There are other worlds that are not similar to the others and these denizens are not so friendly to those of the other worlds. How these other worlds come into play is one of the things I look forward to learning in the series. I mentioned earlier that the magic of this world is tied to astrological ideas but I think that is not the simplest explanation. The world has satellites that orbit the planet on erratic patterns. The people are able to predict their rise and fall for most of them with some ease. There are Para, Zini, Sina, and Tira which are predictable. Oma, the dark satellite, has not been seen in over 2000 years and it’s rising is something conjectured at the opening of The Mirror Empire. Each satellite provides power to the gifted to control of some force of nature. When their satellite is ascendant, they are at full power. When their satellite is gone from the sky, only the most sensitive can call on a fraction of their ability. I like this idea as the source of magic and how it drives the various societies to view the gifted and treat them. It is a very organic magic system that works well both for simple folk in the wilderness to those cloistered in temples. I look forward to learning more abut the inner workings of the gifted and their connections to these celestial bodies. The Mirror Empire was a great but difficult read. These are people that well rounded and fully fleshed. They make horrible decisions and do horrible things to one another. They struggle to make the right decisions despite their own failings and the results go from spectacular to gut wrenching. The world isn’t spoon-fed to you and woe to you if you can’t keep up. Definitely a four bear paws out of four read and a wonderful introduction to the grim dark corner of the genre as well a welcome place to find queerness as part and parcel of the world with no apologies asked for and none needed. I tend not pick up adventures for Dungeons and Dragons. They are tools that I have not used in the past and only vaguely perused in my long and storied history of the game. This was an exception that I was happy to make. It touches on several of the things that I have loved about D&D in the past: Vampires, Ravenloft, and Gothic Horror. There was no way that I was not going to pick up this book once it was released. First, lets talk about the book itself. The Curse of Strahd is a gorgeous tome. It is a full color hard back book. It weighs in at a hefty 253 pages. The art work that is scattered throughout the book is just beautiful and atmospheric. The pieces capture the feel and tone of the adventure skillfully without feeling overwrought and intrusive. The book comes with a detachable foldout map that is also spectacular. I am a fan of the large poster size maps that would come with the box sets back in my youth and the map included with taps into that nostalgia pretty hard. In addition, the map is well done. It provides a large overview of Barovia as well as smaller maps of different areas and places that are important in the adventure. 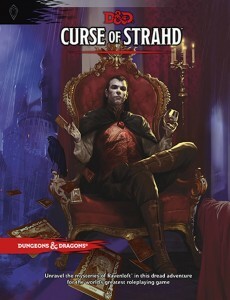 The Curse of Strahd has a retail price of $49.95. To me, it felt a bit pricey for an adventure but it did not stop me from buying it. After having spent some time with the book, it is definitely well worth the price. Now let’s talk about the heart of the matter. As one would expect, the largest portion of this book is dedicated to the adventure. There are chapters dedicated to each of the major locations within the adventure with more time and space given over to Castle Ravenloft itself. There is also a nice introductory adventure designed to bring a group of adventurers into the clutches of Strahd entitled Death House. It is atmospheric and well written to ease players used to a standard dungeon crawl into the realm of Barovia and it’s Dark Lord. The adventure is designed to have the characters moving about the land trying to find a way out. They become aware of the dread tyrant Strahd and their escape is only possible by freeing the land of him and his curse. the pieces of the adventure are modular so that it is very simple for the players to wander through the story in a somewhat non-linear fashion despite it being a linear story. There are several things I loved about Curse of Strahd. First and foremost is the background story to the whole adventure. I love vampires and the Gothic horror theme. I read each Strahd novel that was released and it made me squee a little when I saw that they were releasing this adventure for 5th Edition. I also appreciate the information provided on the mists that surround Barovia and the nature of its people. This information will allow me to take the time to recreate any of the other Dark lord’s of Ravenloft while I await the release of an official setting book to that effect. The mechanic of the card reading is also a nice little touch that I remember from a previous iteration of the adventure that I think is well done in this version. It allows for multiple uses of the adventure. The reading also helps prepare the game master for setting the proper mood for the adventure as a whole. Over all, I love Curse of Strahd. It provides a Gothic horror adventure option for this 5th Edition of Dungeons and Dragons. It hews well to the intent of the original without falling into the current trap of making Vampires misunderstood monsters. It provides plenty of guidance to the GM on how to create the mood for this type of game. There is plenty of room for the character to move on their own despite the linear nature of the adventure. My only complaint is that I currently don’t get to play the game as my group won’t let me play since I have the book. Four bear paws out of four as this is a wonderful addition to any gamer’s Dungeons and Dragons collection. I have spoke about the other two books in the Gentleman Bastards series from Scott Lynch. I want to make it clear that I am pretty biased when it comes to these books. I really love them and that colors my perspective a bit. With that said, on to the review! I tend to be busy with work, gaming, working out, and other life things. So I have taken to listening to audio books while I read. This has the upside of making me extend a workout to finish up an interesting part of a story. 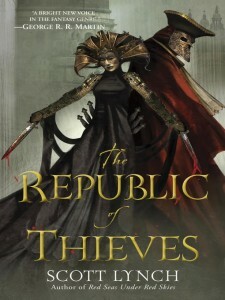 I had read the blurb on Republic of Thieves and I was chomping at the bit to get it read. I had a few other books in the hopper so it took a little bit of time to get it taken consumed. The reason for this is that the blurb teased that the oft spoken of but never seen Sabetha would make an appearance. Since the middle of the first book, I wanted to know why Sabetha cast such a long shadow and why she had left. The story follows the familiar pattern that was established in the first two books. The reader gets to follow Locke and Jean on their current caper while traipsing into the past to learn how they came to this point. Interspersed between these two narratives are interludes that give further insight into the puppeteers that are pulling the strings in the here and now. The story that takes place in the present is very Leverage. Locke and and Jean have to steal an election. We last left our daring duo as Locke gave Jean the only antidote to the poison that the two were given to coerce their servitude in Tal Verrar. Jean struggles to find a cure for the poison, but to no avail. The answer to this conundrum arrives in the form of Patience, a bonds-mage who happens to be part of the reason that Locke is in this predicament at all. She will save Locke’s life if he and Jean agree to win the coming election in Carthane. An accord is reached and Locke’s life is spared. Locke and Jean must overcome a deficit in knowledge, almost dying, and their opponent having an almost two week head start on the competition. Nothing they have not faced before. The bombshell is that their opponent is none other than Sabetha. The opposition knew whom their foes would be choosing to take up their cause and put the most formidable block possible in place. The trip to past provides an excellent echo to the present story line as well as telling the story of Locke and Sabetha’s history. The Gentlemen Bastards have grown into teenagers. And as such, begin getting on each others and Father Chain’s nerves. The entire group is shipped off to be actors in a troupe as repayment of a favor owed by Father Chains. The groups skills will be tested as will their ability to live with one another as there will be no Father Chains to keep them from each other’s throats for the entirety of the venture. I know that I have said this before in regards to this series but I love the dual narratives. In this book more than the other two, it feels more like a symphony. The present day story provides the rising sound and harmonies. It is loud and blustery and filled with emotion. Then we move to the past which is a subtler sound. We listen as the characters dance to a tune much more sedate yet no less engrossing. The tones and nuances built up in the story of the play beautifully highlight what has gone before in the present and provides delicate hints of next movement. I loved this book and it made me sad. I loved it for multiple reasons. first and foremost of these was Sabetha. This phantom that has haunted the edges of the first two books is finally made manifest. I get to learn what made her such an important part of Locke’s history and why she left the group back ion the past. This dip into the past between Locke and Sabetha is wonderful. combined with the process of them reuniting while struggling to control and election is is just wonderful. Onto this, add the depth to the world that is brought to this world through the exploration of Carthane and it’s Bonds-Magi rulers. The story unfolds to show how the Bonds-Magi came to this point in their own history as well as revealing more about the Eldrin and their beautiful creations. I also love to have magic in my fantasy stories and for this is the book in this series that finally delivers it for me. The Republic of Thieves made me sad for two reason. The first is simple, Sabetha. Lynch does an excellent job of making her a robust character that I want to learn more about. He creates an excellent foil for Locke without making her a lesser person. It hurts my heart in the end when she makes the choice she does. I understand the need for the grimdark in this series but I would have loved to see this story ending differently. The story also present an origin for Locke. It spins a tale that is both grandiose and unbelievable as any plan concocted by Locke and Jean. Yet, unlike their plans, there is a seed of truth that makes it hard to dismiss out of hand. It is not that I think it is bad or wrong but that I just don’t want it to be real. I was torn on how to rate this book. I really enjoyed but it made me sad too. Do I give it four paws because it was so good or do I give it two because I did not like how it ended. It bothered me a lot. I finally decided that by virtue of eliciting such a powerful and diverse reaction I need to give it four bear paws out of four. Just because I don’t like and ending does not mean that it isn’t a good ending. What it means is that I hope for another book so that I can see these two parts of the ending resolved in a much better fashion. Now I wait and hope. Red Seas Under Red Skies is the second book in the Gentleman Bastards series by Scott Lynch. It picks up the story of Locke and Jean after they have defeated the Grey King and saved the lives of all the nobles in their city from a fate worse than death. With their identities now known to the spymaster of the city, the two must flee to quieter places to both recover from plan. Locke and Jean have set up shop in Tal Verrar. Locke has once again taken up the call of the Crooked Warden and embraced the two core tenets of the faith. Thieves prosper and the rich remember. He and Jean have invested two years of time and effort with the goal being the the easily accessible riches of the Sinspire. The Sinspire is the largest and most popular gambling hall in Tal Verrar that not only serves the less reputable needs of the nobles of the city but also as a defacto neutral bank. So, even those with more respectable pursuits have reason to call upon the Sinspire. When I talked about the first book in the series, The Lies of Locke Lamora, I mentioned that I really loved how the book had the feel of the show Leverage. Going into the second book, I had worries that Lynch would be able to maintain that feel in this book as second books tend to be pale imitations of their progenitor. This was not the case for Red Seas Under Red Skies. This books seems to take the idea of the thief with a conscience and makes it it;s own. This book scaled back the brutality that was predominant in the first book and replaced it with a greater amount of characterization of all the players upon the stage. This is no mean feat considering how much I enjoyed the characters that Lynch created in the Lies of Locke Lamora. I was happy to see that Lynch continued with his style of jumping between the past and present to present the reader with what had gone before. I loved getting to know about the trials and tribulations that Jean and Locke had endured in their flight and recovery from the the events of the first book. Their strained relationship while Locke recovered provided good tension for the book as the narrative took me from the apparent betrayal in the opening scenes to the sad turn of events as Jean and Locke work hard to save their new pirate friends from betrayal from within. I loved this book! Lynch continues to switch the narrative time-wise. he first gives us the action that is taking place currently and then switches to tell the tale from the past. he movies each story forward so that they not only support each other but that despite knowing that the how that past story line turns out, it is still gripping and interesting in it’s own right. In particular, he tells the story of a small city that lies outside the jurisdiction of Tal Verrar. It is a city to which the poor of the region pour into on a daily basis. We get to follow Locke as he discovers the reason for this migration and the horrific treatment that these people receive in the luxurious resort city. This city seems like a distraction with very little impact on the greater story yet, it does. Locke and Jean are forced to take on the role of pirates with not near enough preparation. When things go south, it is only through serendipity or divine intervention that they are rescued by pirates that see the value that is hidden within these two. Their time with the crew of the Orchid teaches them both a better understanding of what life is on the high seas and well as the nature of thieves is not exactly how Locke had initially viewed it. Locke is honest with the captain of the ship and enlists her aid in setting himself and Jean free from the shackles of the military ruler of Tal Verrar while still working to complete their initial job. It is here where the pleasure city becomes important once more. To appease their new master, the pirates must be seen as a threat. To keep their new allies safe, they must stay out of the grasp of the Tal Verrar navy. To appease the Crooked Warden, Thieves must prosper and the rich must remember. Cue the sacking of the city that uses the poor as chess pieces to be beaten and abused for the pleasure of the rich. One of the things that I had heard about in reviews of the this book was that the outcome was predictable. I am not going to say that this isn’t true but that it misses the point of the book. 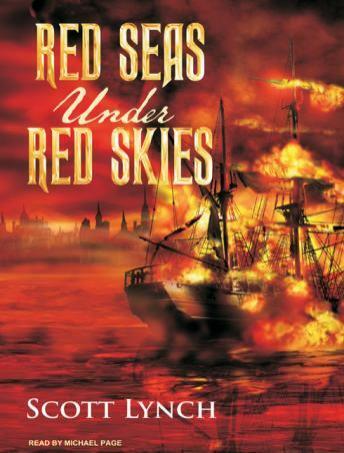 The outcome is not why I read Red Seas Under Red Skies. I read this book to see the interactions between Locke, Jean, and the cast of characters that are strutting upon the stage. I wanted to see more of the relationship between Jean and Locke and this book delivered this with aplomb. I wanted to see what kind of trouble that the two would get into this time and the trouble was deep and engrossing. I wanted to learn more about this world that they live in and Lynch delivered this knowledge in a most interesting fashion. On top of all of this, Lynch delivers a world that is diverse without ever feeling heavy handed. The characters run the gamut. They cross all lines of Socioeconomic status, gender, queerness, and capabilities. These characters are each treated as people with motivations and emotions as opposed to cardboard cutouts or caricatures. Lynch creates characters that you care about regardless of their importance to the plot. I loved this book! The arc of the story made me come to love Locke and Jean even more while making me wish some of the characters we met along the way would be continuing their journey with these two. I know that this is not true which made the end of the book bittersweet as I had to say goodbye to some characters I had grown to love and mourn those that could never return. A definite four bear paws out of four. Well worth adding to one’s library and reading again at some point.